What’s native to the southeast US, has great red fall color and has huge white flowers that last all summer? 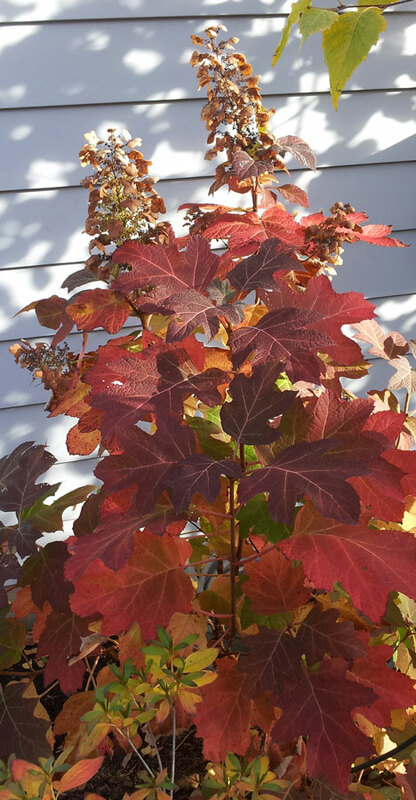 It’s the bold oakleaf hydrangea (Hydrangea quercifolia). OK, that might be a little over the top. But in some ways it’s not. 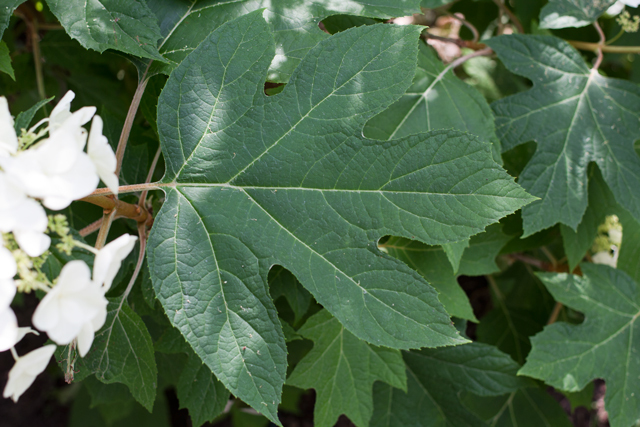 The oakleaf hydrangea’s leaves can be 8 inches long. 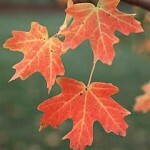 Probably not a surprise, it’s leaf is shaped like an oak tree (Quercus). What that big leaf does is create a bold texture when compared to the smaller leafs of other plants. Oakleaf hydrangea’s have a lot of “visual energy” that draws the eye to them. That bold texture makes the plant really standout. 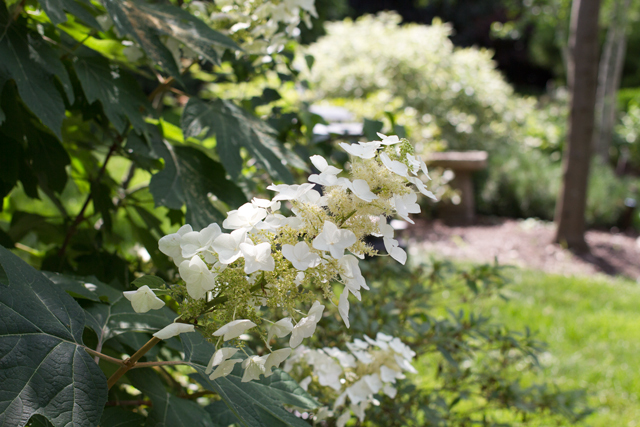 The oakleaf hydrangea is truly an accent plant for the landscape due to its leaf texture during the summer. It may be too much for some borders, but by itself or in groupings it looks great in woodland style gardens. After the spring blooms, flowers are a bit harder to find. When it flowers in mid-summer, Hydrangea quercifolia truly shines. White is not the most exciting flower color, but it is probably the one seen most often in nature. It thus looks the most natural and fits in almost all landscapes. Another benefit of white flowers is that they are easy to see in dim light, such as in the evenings. 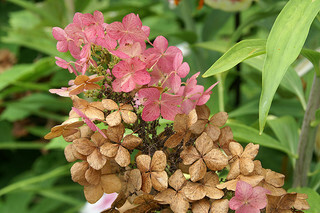 Oakleaf hydrangea cone shaped flowers start a nice pure white when they open in summer. After a few weeks, they slowly color to a pale pink tone. Then in the fall they turn a nice tan color. In my yard, the flower heads stay on the plants through most of winter. While a dried oakleaf hydrangea flower head can’t complete with a hybrid witch hazel in full bloom in January, they do still provide a nice winter interest, especially when set off with some evergreen ground cover. After the flowers have done their thing in the summer, the bold leaves of this hydrangea turn a red to purple fall color that is a great complement to yellows and oranges of other plants. It is not a brilliant red like a burning bush, but instead is a very nice multi toned effect that evokes feelings of a woodland fall scene. Oakleaf hydrangeas have upright growing stems with little branching. They grow multiple shoots that form mounded colonies not unlike red twig dogwoods. 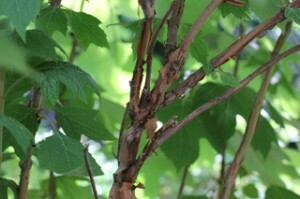 The stems are brown and after a few years begin to exfoliate. This exposes a cinnamon brown colored bark that adds some color to the winter landscape. They are great for massing, as accent plants in mixed borders and woodland gardens. I think they look best in the winter especially when they are in a bed of evergreen ground cover. If they are in a mulched bed alone without evergreens nearby they can look a little bare and twiggy in the winter. However, in the summer they look great in a mulched woodland type area. 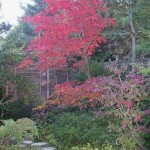 My favorite use would be planted throughout a woodland garden under a canopy of deciduous trees such as birch. Pee Wee Oakleaf hydrangea ((Hydrangea quercifolia ‘Pee Wee’) – This is a smaller plant that gets 3′ by 3′ and have smaller leaves and flowers. Flowers get about 4-5 inches long. 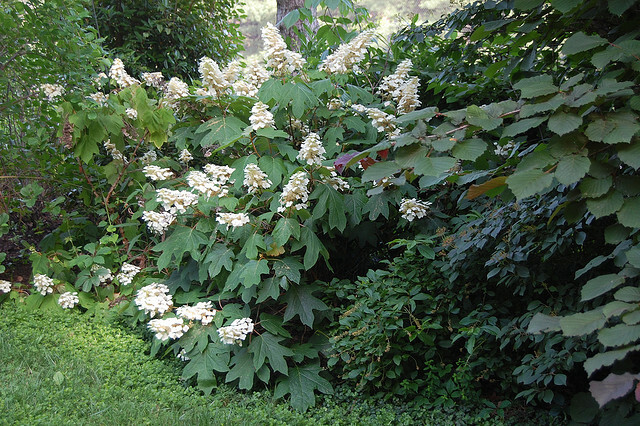 Snow Queen Oakleaf hydrangea (Hydrangea quercifolia ‘Flemygea’) – This one grows 6′ by 6′. It has great flowers that don’t flop over like some of the regular ones and get 6 to 8 inches long. Dirr says it holds up well in full sun and is winter hardy down to at least -22 degrees. This is definitely one to look for if you are in zone 5. Sikes Dwarf Oakleaf Hydrangea (Hydrangea quercifolia ‘Sike’s Dwarf’) – This is another dwarf one that gets 3′ high and 4′ wide. 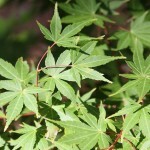 It also has much smaller leaves than the species. Toss up between this and Pee Wee for small ones. What zone is it hardy to: 5-9, in extremely cold winter’s flower buds may be damaged or the plants may die back to the ground, but will regrow stems from the roots. Sunlight: Sun to shade, needs at least a few hours of sun for flowers. 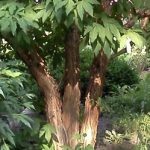 A great plant for a shaded spot or yard. Cultural Requirements: Oakleaf hydrangea grows best in moist, well-drained, slightly acidic, organic rich soil but hey what doesn’t. They are native to limestone rock soils in the southern US and should do fine in most decent soils. Mulch is recommended for keeping roots cool and moist. Flowers on old wood and should be prune after flowering; remove winter-damaged stems as soon as leaves begin to emerge in spring. Problems: Pretty trouble free except that deer love them. If you liked this article, sign up to receive my posts by email by using the form below. I would speculate that this is weather related. Either an impact from last years drought and heat when the dlower bud was forming or as you described the wetter than normal conditions this year as the flower was emerging. I would expect it to be more normal next year. Would the snow queen do ok about 10 feet from a 7 inch wide hickory tree? After having my Oakleaf Hydrangea for many years (possibly 10), multiple shoots are coming up around the base of my Oakleaf Hydrangea. Should I remove these much smaller shoots or just leave them to grow as they please? I’d just let them grow. I’ve let my oakleaf grow large and they have the reddish blooms still on the plant. It’s September now so when should I prune to ensure they bloom again next summer? In the early spring? The flower buds developed on this season’s stems already for next year’s blooms. Prune hard every few years and miss flowers for one year and let it go the other years. Thank you for your quick reply!! Would it be OK for me to then prune SOME of the stems and branches and leave other stems/branches alone and those would still bloom next year? Depending upon your climate you may want to wait till early Spring to move (if you are in zone 5). You don’t need to prune them, they may die back over winter, so just prune off obviously dead branches in the Spring. If they die to the ground, they should grow back from the base but it will be a bit later in the season. We just brought back a “shoot” from our friends’ plant in southern Indiana. We live in Iowa and need to know what procedure to use when transplanting it, this time of year. Should we just put it in a pot and keep it moist inside through the winter or just plant it outside? It is such a beautiful plant and we want to keep it that way. I think I would keep it slightly moist in a protected but still cold spot, such as an unheated garage or shed. It would not hurt to insulate the pot with some straw too so the roots stay even warmer. Don’t overwater it, but don’t let it dry out either. How often that would be would depend on what type of soil the plant is in. It might mean watering it once a month or less.